L.A. County is investing $160 billion into a massive expansion of its transit system, the largest public infrastructure project in the country. But the County also has the worst homelessness and housing affordability crisis in the nation, ranks 7th in income inequality, and is the top jailer in the world. As the region transforms, how can housing, labor and racial justice movements ensure that our public investments uplift rather than uproot? What kind of models can we create in L.A. that can be replicated elsewhere, especially as the Trump Administration proposes the privatization of infrastructure across the country? 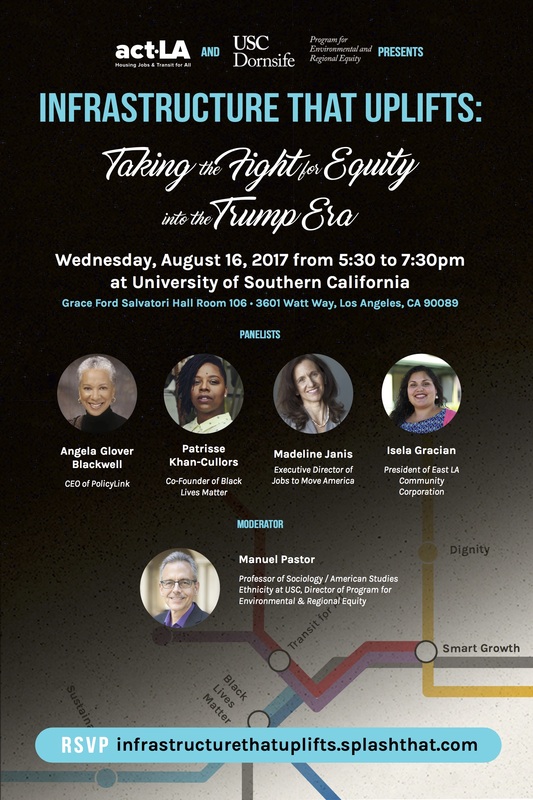 Join us in for a conversation with veteran equity champions who will share insight on how to ensure equity in public investments. RSVP at infrastructurethatuplifts.splashthat.com.